Another Winter X-Games is in the books, and another two gold medals hang around the neck of one of the world’s most decorated and diversified snowmobile athletes. After a two year absence from the Winter X-Games, Levi LaVallee returned and increased his medal count to nine (six of them being gold). LaVallee had a jam-packed weekend in Aspen, as he was the only athlete scheduled to compete in all four snowmobile disciplines: Freestyle, Speed & Style, Snocross, and Best Trick. LaVallee’s first event was Snowmobile Freestyle and took place during the first night of Winter X. With huge extensions, perfect landings, and demanding tricks, Levi put on a performance worthy of a gold medal. With no snowmobile events scheduled for Friday, LaVallee was back on his sled on Saturday for Snowmobile Speed & Style, which is a combination of racing and freestyle. LaVallee ran away with his second gold medal of the weekend, out racing and out performing his competition in each of the three rounds. Unfortunately, Levi tore a muscle in his lat during his gold medal round, ending his 2013 Winter X-Games early. Although Levi was out, Team LaVallee had two other athletes competing in Sunday’s Snocross event. Jake Scott, the team’s youngest rider, came to the X-Games as an alternate, but was given the opportunity to compete when another racer suffered a concussion in practice. Scott joined Team LaVallee’s other rider, Kyle Pallin in the Snocross competition. Pallin put out the 5th fastest lap time of all 23 riders during practice, but unfortunatley lady luck was not on his side and he was unable to make the final. However, Scott found himself in the front row of the final and with consistent riding, the 18-year-old finished in 7th place at his first-ever X-Games!Congratulations, Jake Scott! 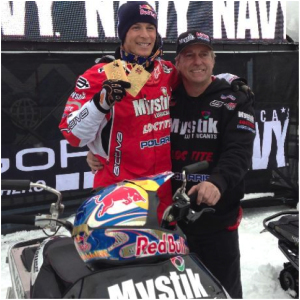 Congratulations to all of the team athletes and crew, including Glenn Kafka, crew chief and co-owner of Team LaVallee, on a stellar performance at the 2013 X-Games! Keep up with Team LaVallee as they finish off the 2012-2013 race season! Follow Team LaVallee on Facebook and Twitter, or see Glenn and the team in action at a race near you! Kafka Granite sponsors Team LaVallee, along with Mystik Lubricants, Loctite, Polaris, Parts Unlimited, Arctiva, Fox Shox, Earth, Inc., Woody’s, Kafka Conveyors, and Stratford Sign Company. On a much more somber note, one of the world’s best freestyle snowmobile athletes passed away on January 31st as a result of an unfortunate crash during the Winter X-Games. The Kafka family, who has long been a part of a very tight-knit snowmobile community, continues to send their thoughts and prayers to the Moore family during this extremely difficult time. 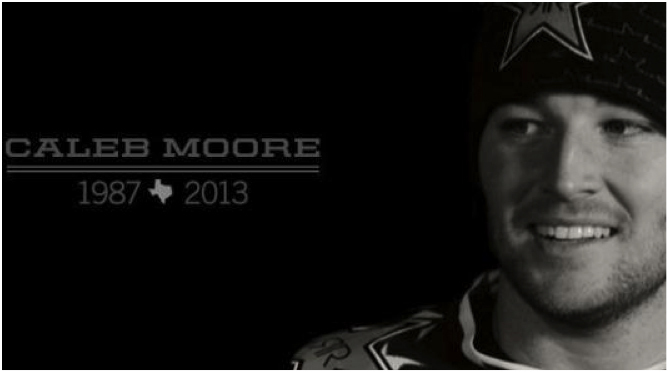 To make a donation to the Moore family, please visit GiveForward.com/CalebMoore. Ride in Peace, Caleb. It’s that time of year! Spring is just around the corner and before you know it landscapers will be breaking ground on new and exciting projects. While there is still a white blanket of snow covering most of our lawns, homeowners are starting to plan for maintenance or new renovations of their yards, gardens, and outdoor living quarters. When the ground thaws, be prepared for the springtime rush with Kafka Granite landscape stone, boulders, and mulch! Kafka Granite offers one of the most extensive color palettes in landscape stone. With crushed stone and river rock available in roughly 20 colors and several sizes, Kafka Granite is bound to have just what your customer is looking for, whether it be for homes, commercial properties, parks, or gardens. Looking for something new for the 2013 season? Kafka Granite has added several new colors last year such as Twilight Black, Shamrock Green, and Sugar & Spice, just to name a few. To complement the line of landscape stone, Kafka Granite also offers Decorative Rip Rap. These raw, fractured, natural colored boulders vary in size from 4-12 inch pieces all the way up to over four feet in diameter. These decorative rip rap pieces are practical for retaining walls and water features, but also make for uniquely beautiful accent pieces. Kafka Granite’s Wisconsin Granite Cobbles and Boulders make for some of the most beautifully colored, rounded boulders around. 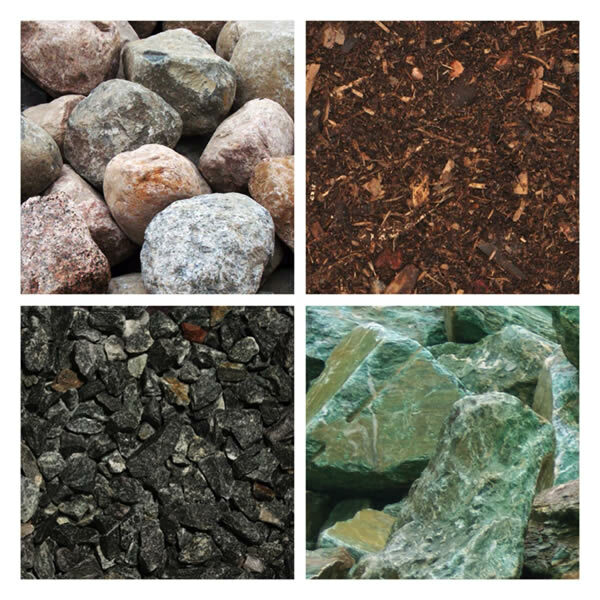 These glacially deposited, smooth, multi-colored boulders are available in a wide range of sizes from 3-6 inch cobbles all the way up to massive 5 foot accent pieces. These boulders are perfect solution for retaining walls, ponds, man-made water falls, and more. While Kafka Granite is a premier source for landscape stone and boulders, don’t forget about the mulch! Since starting a new venture in wood waste recycling, Kafka Granite now offers pine bark available in two sizes: 3/8-1 1/2″ flake and 3/8″ minus. Make Kafka Granite your one-stop shop! Stock up now on all your landscape stone, boulders, and mulch. Contact one of our knowledgable sales representatives today for more information, samples, or a competitive quote!